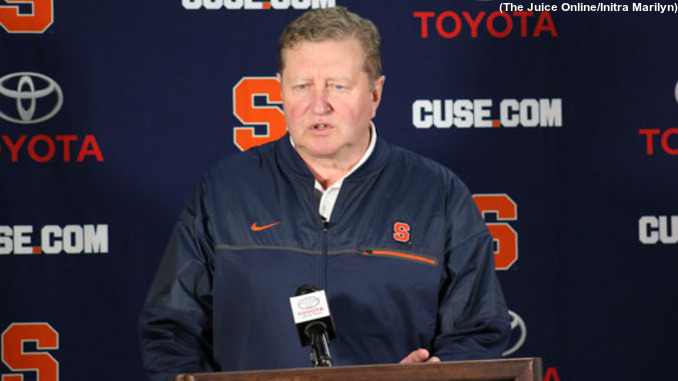 Syracuse lacrosse head coach John Desko speaks during a press conference. MANDATORY PHOTO CREDIT: Initra Marilyn, The Juice Online. Though the final score of 15-3 may not have showed it, Syracuse goalie Dom Madonna had a strong showing against Albany on Saturday. Madonna, under duress all afternoon from 26 Albany shots, stopped 11 of them, including nine in the first half. It allowed SU to remain within striking distance at halftime, with the Orange trailing 4-1. Hard to imagine the “different” score if it hadn’t been for Madonna’s outing. Albany’s defense was strong as well, backed by goalie JD Colarusso, who notched ten saves on the day. “We were behind and we felt like we had to catch up, and you can’t do that against a seasoned defense like this,” Desko said. That seasoned defense has been paired with a potent offense led by the No. 1 recruit in the 2018 class, Tehoka Nanticoke. He was unstoppable in every way in his collegiate debut with five goals. Nanticoke was matched up with Syracuse’s Tyson Bomberry, who struggled to contain him. While pressure and expectations for Nanticoke have mounted high, he certainly lived up to the hype in his first game.